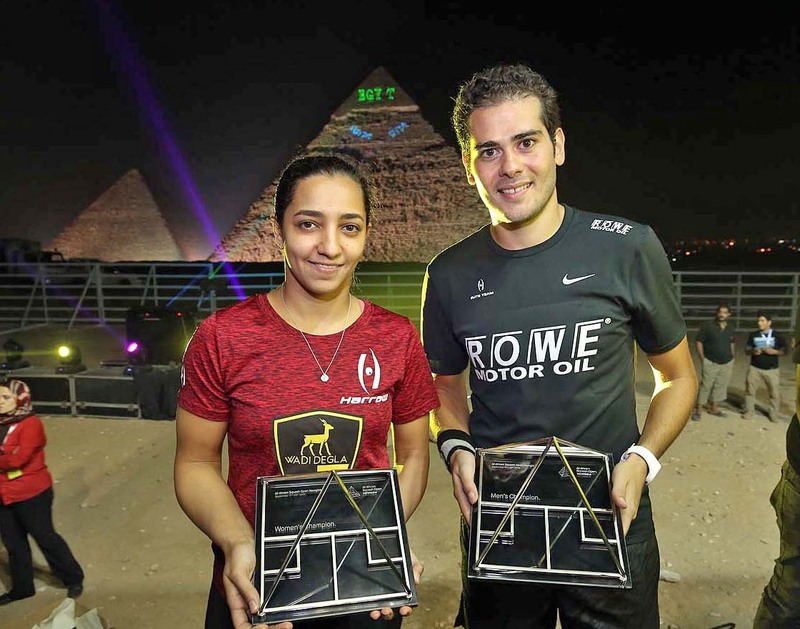 In front of one of the most iconic sporting backdrops of all time - the Pyramids of Giza - it was local man Karim Abdel Gawad, the World No.6, and Women's World No.5 Raneem El Welily who took the spoils in the 2016 Al Ahram Squash Open NewGiza to write their names into Egypt's sporting history books. In the shadow of the iconic structures Gawad, who came past World Championship runner-up Omar Mosaad to reach the title-decider, overcame Ali Farag - the Cairo-born World No.10 - in straight games to become the first Egyptian to taste success here since the legendary Ahmed Barada in 1998, while El Welily overcame the challenge of compatriot and World No.1 Nour El Sherbini to become the first Egyptian woman ever to win the iconic title. 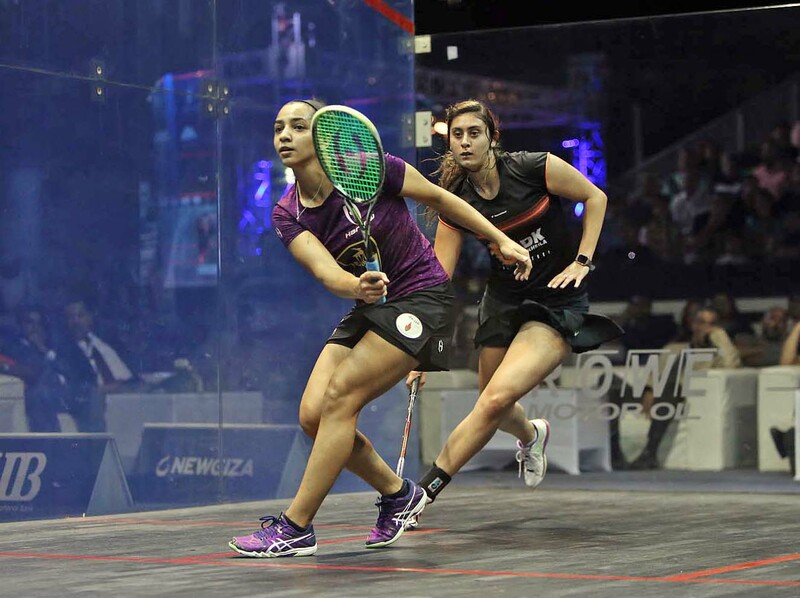 Receiving almost $17,000 each - the first time a major squash tournament in Egypt has offered parity in prize money - the duo delighted the capacity crowd to claim arguably the most important wins in their careers so far. "It's a great pleasure for anyone to play at this amazing venue - which is one of the most amazing locations of all time," said Gawad. "As a player it is a dream just to be here but to win it is incredibly special. “At the beginning of the tournament my only aim was to win my first round and to get to play one match at the Al-Ahram Glass Court. So I am so happy to hold and raise the trophy now. It was only at Championship Ball that it hit me, that I was about to win this tournament. 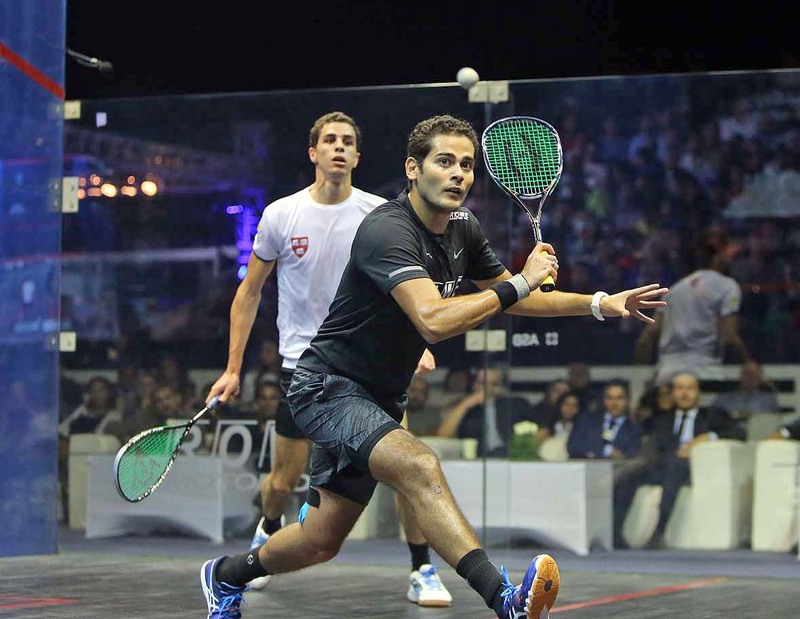 24-year-old Ali Farag recorded one of the biggest wins of his career as he halted the charge of title-favourite and World No.1 Mohamed ElShorbagy to move one step closer to becoming the first home-based player to win the iconic Al Ahram Squash Open NewGiza - the $100k tournament taking place at the foot of the Great Pyramids of Giza - since Ahmed Barada in 1998. 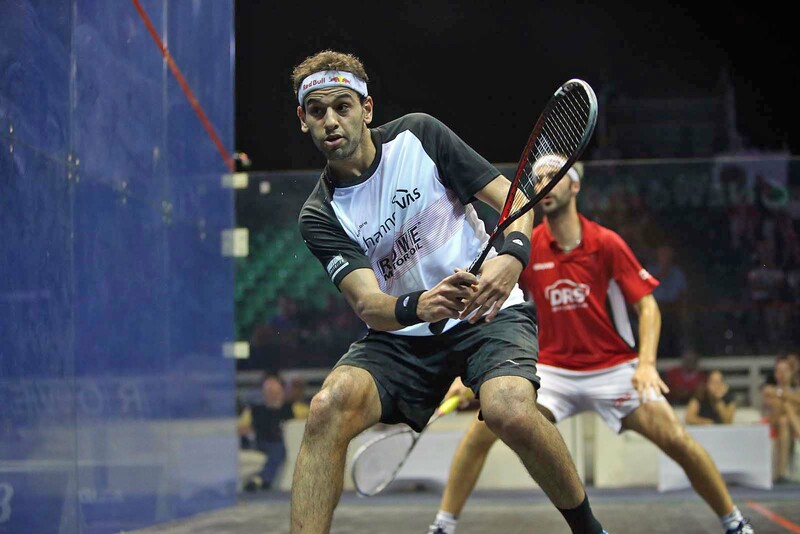 Competing in one of world sport’s most breathtaking locations, Farag - who earned a berth in the last four following the retirement of three-time World Champion Ramy Ashour during their quarter-final encounter - produced a sublime performance to come through in four games and earn a richly deserved win after 70-minutes of high quality squash. After losing the opening game Farag fought back to level against ElShorbagy and then take a 2-1 lead. Then, with both men giving their all, they traded points in a series of ferocious exchanges as the score reached 10-10 in the crucial fourth. A first match ball went to waste as ElShorbagy mounted a last ditch charge before Farag responded in style and take the game, and with it the match, 14-12. 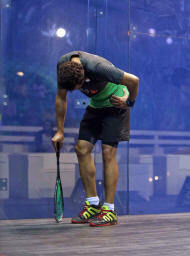 "I have the upmost respect for Mohamed - he's been the best in the game for the past two seasons hands down," said Farag. "I knew that to have a chance I needed to be at my absolute best, but I've been preparing well since Hong Kong and got in a big chunk of training before this event that I think made the difference. "Mohamed can be very intimidating at times with how big he makes himself on court - like any top player does - but I knew the biggest battle today would be mental. I had to match him mentally and that's what I did. "Before the event I looked at the draw and knew it would be tough - but names are just names - you go out and play to win. At Motor City Open I had the toughest draw possible and won so I know I just have to believe in myself." 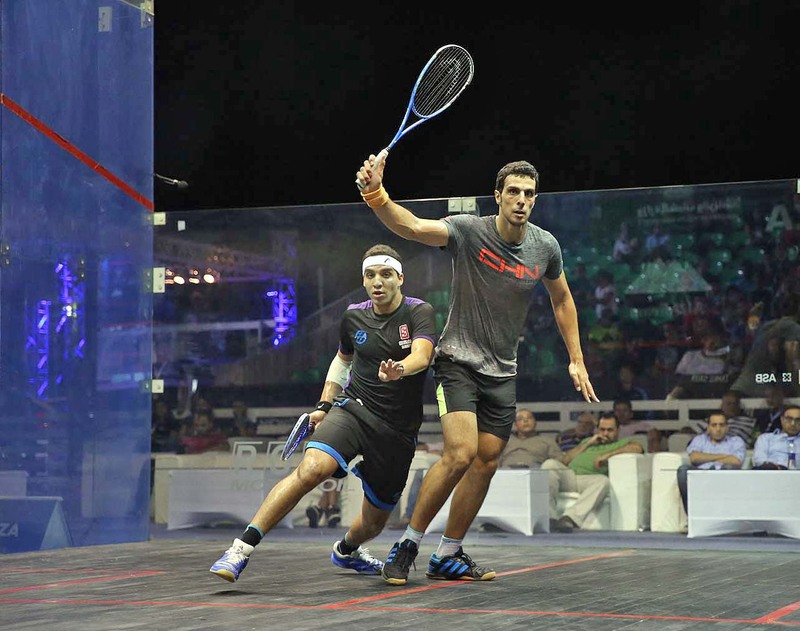 Farag will face compatriot Karim Abdel Gawad - the Hong Kong Open runner up - in the decider after he saw off second seeded Omar Mosaad 3-0 with a performance that underlined his status as one of the most in-form players on the Men’s Tour while Farag's wife Nour El Tayeb bowed out of the women's event at the semi-final stage, losing in straight game to the in-form play on the Women’s Tour this year - Nour El Sherbini. World No.1 El Sherbini has scythed her way through the tournament so far without dropping a single game and she impressed once again to underline her status as the player to beat as she came through 11-7, 11-8, 11-4 in less than 30 minutes. "I was very focused from the beginning today and worked hard not to let her get in front and I'm glad to come through in three games,” said El Sherbini. "I've been dreaming of playing here since I was ten years old and playing in front of the Pyramids and the Egyptian crowd. I'm really proud to be here and have my family and sponsors there to see me play so hopefully I can keep it going now in the final." El Sherbini will face Raneem El Welily, the 27-year-old who held the World No.1 spot at the end of 2015, in what promises to be a gripping encounter after she stormed past England's Sarah-Jane Perry to end all international interest in the $100k event. “I used to come here with my brother and my parents, we were so young then, and I remember we were fascinated by everything, so being here means a lot for me,” said El Welily. 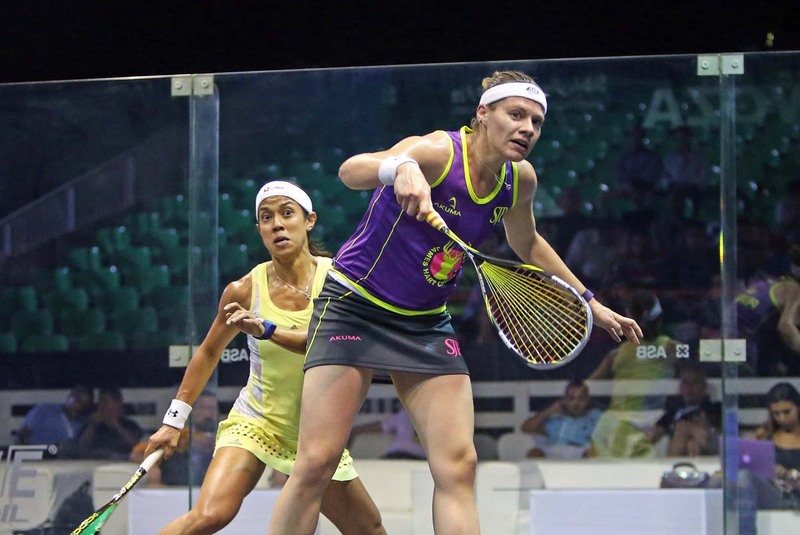 26-year-old Sarah-Jane Perry, the World No.14 from Birmingham, England, pulled off the biggest win of her career and one of the biggest shocks of the season as she downed eight-time World Champion Nicol David in the quarter-finals of the Al Ahram Squash Open newGiza - the $100k tournament taking place at the foot of Egypt's Great Pyramid of Giza. In front of one of the most iconic structures in the world Perry produced a performance of epic proportions, coming from 2-1 down to win a gritty five-game battle and record her first ever victory over the woman who topped the World Rankings unopposed from 2006-2015 - just 48 hours after ending a nine-match losing streak to French World No.6 Camille Serme in the first round. "I don't know what to say," said Perry afterwards. "She's such a fierce competitor. I was up in last game and I had to play some ridiculous squash to beat her. "Nicol never stops - I've had lots of game balls against her before and lost them all, so I knew I had to keep focusing until the end because it's never over against her. "Then at the end I got a bit emotional because it was a big win for me. It's the result of a lot of hard work paying off and also my first win against her. I didn't feel my best today but I made myself put everything into it. "If you told me pre event I'd make the semis I wouldn't have known what to say - it's all a bit of a blur to be honest." 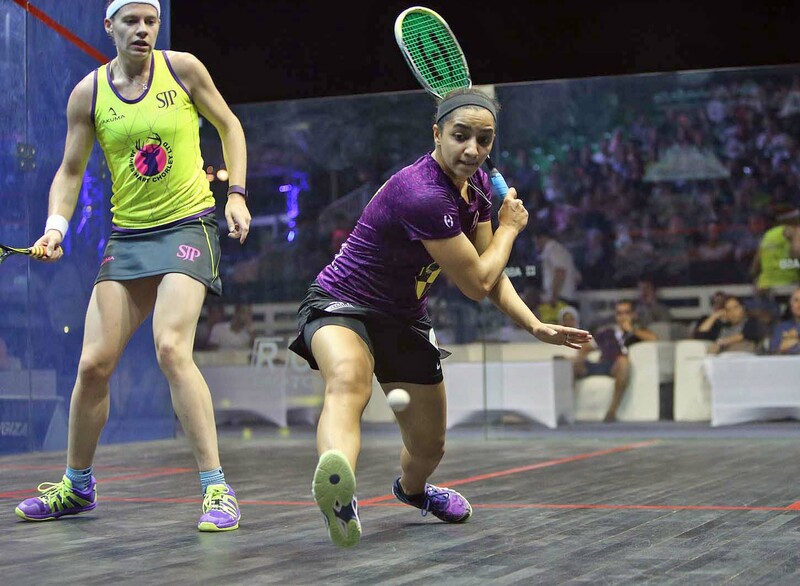 Perry will now face Raneem El Welily for a place in the title decider after the Egyptian ended the charge of American Amanda Sobhy in a rapid fire four-game encounter that saw the pair exchange points at a blistering pace from the off. 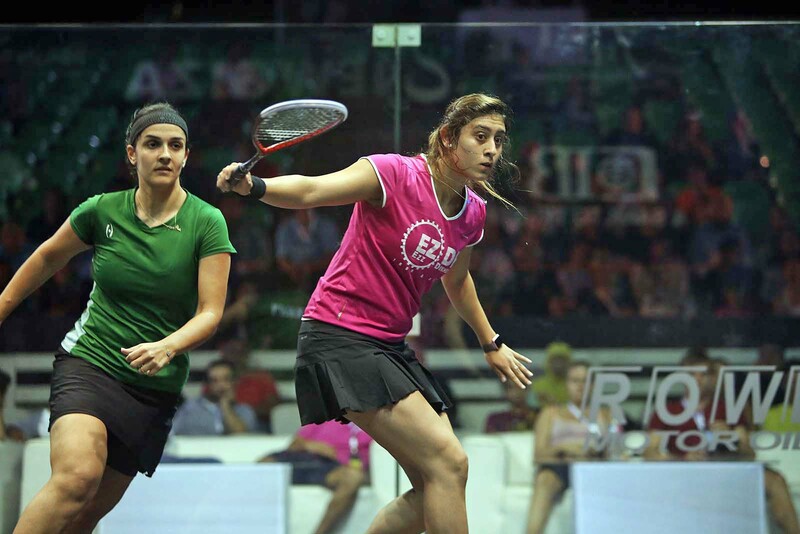 "I'm happy to come out as the winner today," said Raneem. "In the second game things weren't going my way and I went a little flat - which is what happened in the last two tournaments - so I'm happy I came through in the end. "Last time I played Sarah-Jane it was very close but she's much more solid now. But so am I. So we will see." 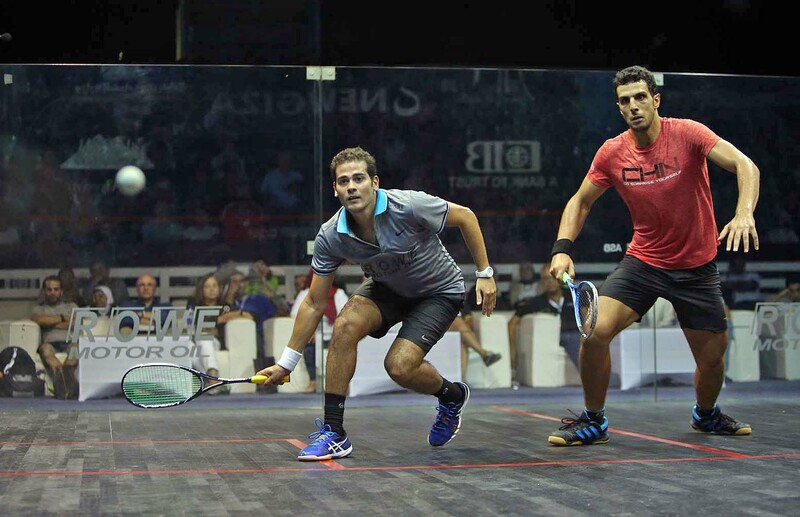 In the Men's draw Omar Mosaad ended the run of tournament lucky loser Zahed Mohamed in a hard fought straight-games win while Karim Abdel Gawad produced a scintillating performance to defeat Tarek Momen 3-0. Gawad reached the final of the Hong Kong Open last month, narrowly losing to Ramy Ashour in the finale, and sent a strong message out to title-rival Mohamed ElShorbagy as he dictated the play and commanded the court to leave Momen with no answer to the 25-year-old's skill and accuracy. 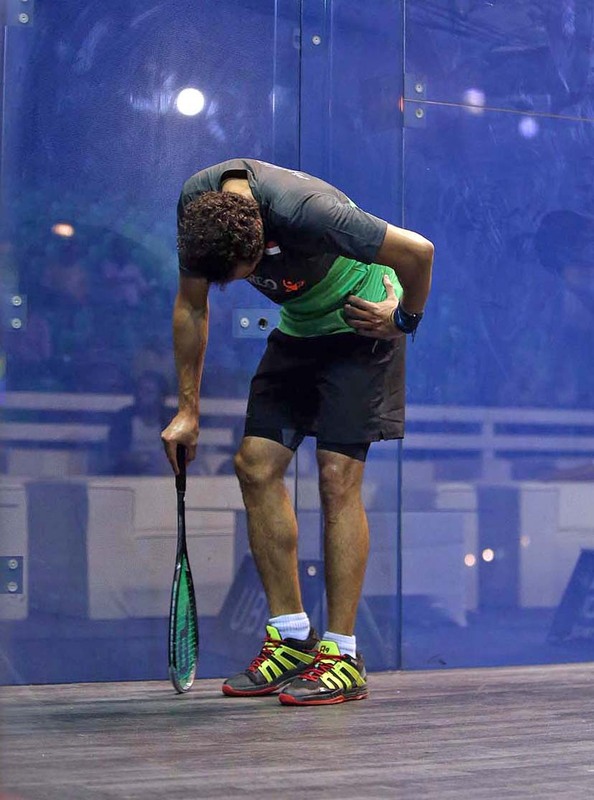 Three-time World Champion Ramy Ashour's hopes of winning the 2016 Al Ahram Squash Open NewGiza - the illustrious $100k tournament taking place at the foot of the Great Pyramid of Giza - and writing his name into Egyptian sporting folklore came to a crushing and premature end as he limped off court during today's quarter-final encounter with Ali Farag. Mid way through what was shaping up to be a closely fought and entertaining first game Ashour stopped after an innocuous looking movement, but was immediately in pain and was forced to shake his opponents hand and concede as his injury demons struck once again to grant Farag passage into the last four to face World No.1 Mohamed ElShorbagy. 25-year-old ElShorbagy, who last month surpassed Ashour's mark of 21 months as World No.1, looked shaky on his debut appearance here last night when he came from behind to knock out Cameron Pilley and he again found himself behind on two occasions to Germany's Simon Rösner before coming through to end all international interest in the Men's draw. "I felt flat today," said ElShorbagy afterwards. "I had to push hard mentally to make it happen and make sure that it would take a lot of effort to beat me here. "He was playing very well but when I pushed I think he went defensive and that helped me. "To be honest I'm proud that I could win today. It's moments like this that separate the top athletes from the others - today was tough but I live for these kind of challenges." In the Women's draw there was further local joy as World No.1 Nour El Sherbini dispatched Omneya Abdel Kawy with ease before wildcard Nour El Tayeb followed up her impressive first round defeat of the in-form Nouran Gohar to come through a thrilling 83 minute battle with England's Alison Waters. El Tayeb came out firing and looked to be on her way to a comfortable victory as she took a 2-0 lead, with Waters looking out of sorts, but the Englishwoman mounted a gargantuan challenge, saving multiple match balls in the third to take it 13-11 and then securing the fourth game 14-12 before El Tayeb delighted the crowd with an 11-8 win in the fifth. "I think that is the toughest match I've ever won," said El Tayeb after. "I've never been match ball up and lost before and there was a lot going through my head. It got quite heated and I just panicked. "I told all my friends to come and watch me and the thought of losing was going through my head. At 10-8 in the third I had that thought of winning and having that picture of the pyramids in the background and boom it hit me and I crumbled. "But I kept pushing and pushing and I have a rest day tomorrow so I can train and work on a few things and hopefully play better in the next round." 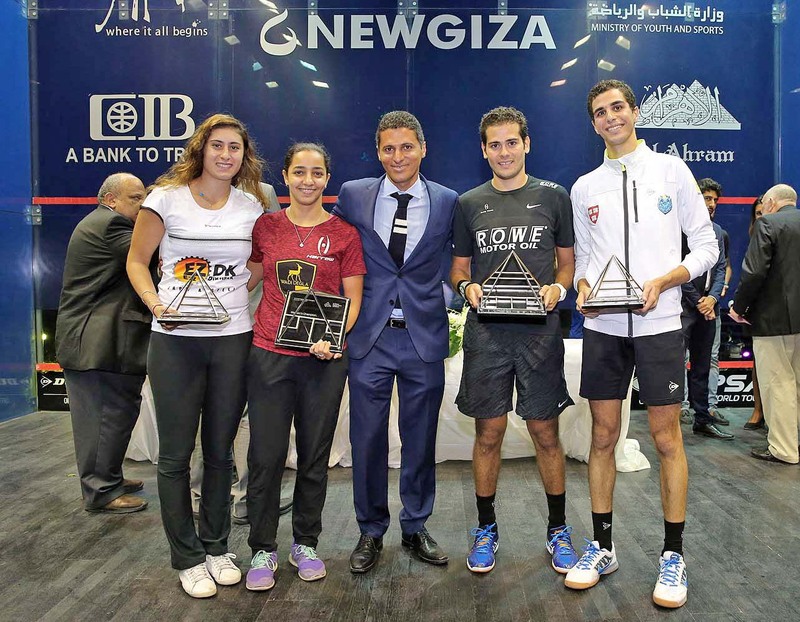 The opening day of action at the 2016 Al Ahram Squash Open NewGiza saw Egypt underline its position as the leading force in world squash as World No.1s Mohamed ElShorbagy and Nour El Sherbini led an eleven strong local contingent into the quarter-finals of the M100 and W100 tournaments that are taking place in the shadow of the iconic Great Pyramid of Giza. In the first match to take place at the location - one of the most iconic in all of world sport - in a decade, Women's No.1 Nour El Sherbini put aside the distractions to defeat Australian Rachael Grinham 3-0 and set up a last eight meeting with Omneya Abdel Kawy. "I've been really excited since I knew the tournament was happening," said El Sherbini afterwards. "It was my first ever time here at the Pyramids so it was very exciting. The court is amazing from the inside - and I think it will be even more amazing later in the week. "But I had to focus really hard to play my game and focus on the squash and I'm happy to come through." 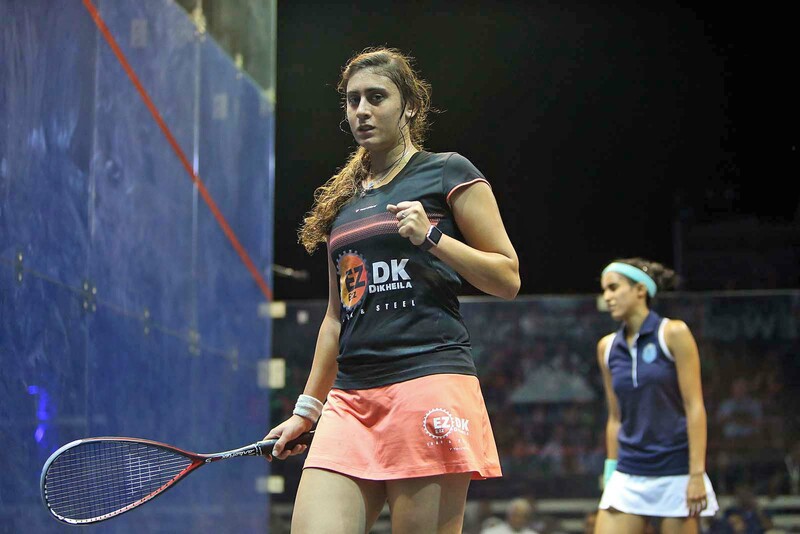 Joining El Sherbini and Kawy in the last eight are former World No.1 Raneem El Welily and tournament wildcard Nour El Tayeb, who pulled off the biggest win of the day as she turned the form book upside down to stun the in-form World No.4 Nouran Gohar - winner of last month's Hong Kong Open - in a thrilling five-game battle at the secondary court. El Tayeb went 6-0 down in the first game as Gohar picked up where she left off last time out, playing at full power to annihilate the ball and leave her opponent stranded, but turned it around in the second to set up a thrilling finale that ebbed and flowed until El Tayed edged it to ensure she will play at the foot of the Great Pyramid of Giza in the last eight. "I was so scared of being bageled in that first game - she was playing so well and it was hard to get into the match," said El tayeb. "I've been working on my attitude and to keep pushing regardless of the score. I kept pushing and stayed positive and she started to make errors and I was back in it so it's a very good day. "It's a dream come true to be on the glass court. I remember going there in 2001 and it was so exciting - I can't believe I will now be there but I have to treat it just like another venue." In the Men's draw ElShorbagy avenged two consecutive defeats to Australian Cameron Pilley to ensure he got his campaign off to a winning start at the head of a seven-strong Egyptian contingent and he'll be aiming to end all international interest in the tournament tomorrow when he takes on Germany's Simon Rösner. 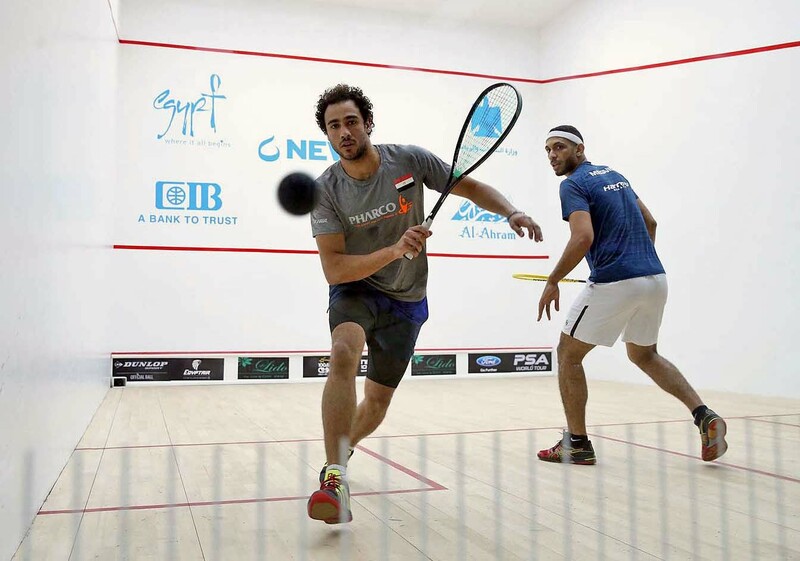 ElShorbagy lost out to Pilley in last month's Hong Kong Open - a tournament compatriot Ramy Ashour went on to win - but made amends by coming through 3-1, although he looked far from comfortable on court. 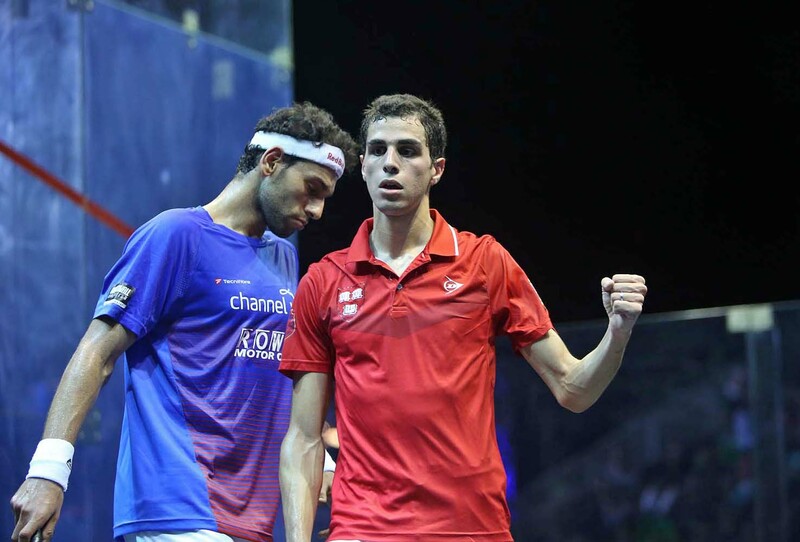 "I was really nervous throughout the match," said ElShorbagy. "He wasn't playing his best and he almost took me out today. The last two times we played, he beat me and he was playing incredibly well so today, being in Egypt as well, made it extra tough. "I had to be mentally strong - I wanted to win today however it took and I'm happy about that." Coming into the tournament 28-year-old Ashour was the only player in the Men's draw to have previously played at the Pyramids, when he lost to Gregory Gaultier in 2006, and he'll be hoping to reverse his fortune on the after seeing off the challenge of Omar Abdel Meguid on the secondary court to move into the last eight. "The name of the tournament and the prestige of it is on your mind and I think if you asked every Egyptian player they all think the same about this tournament - there is so much energy in this area and it is so special," said the three-time World Champion. "When I was a kid I used to go there and watch the matches. I didn't have a ticket one time and I remember crying to the security guards to try and get up there and it being one of the worst days of my life. "I remember the goose bumps and the atmosphere of being up there. I only played there once and lost, so I'll try and change that record now." 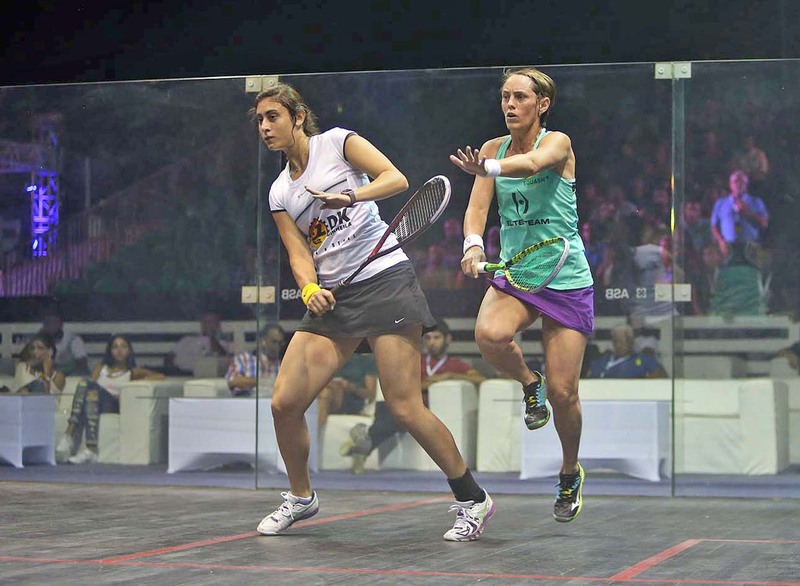 The closing day of qualification action at the 2016 Al Ahram Squash Open NewGiza saw a quartet of international players dash local hopes as all four Egyptian representatives in the Women's finals bowed out - while their male counterparts were denied a clean sweep of victories by Scotland's Greg Lobban. Australian former World No.1 Rachael Grinham, Welsh star Tesni Evans, Malaysian Low Wee Wern and England's Fiona Moverley all came through to defeat local players Mariam Metwally, Hana Ramadan, Nadine Shahin and Salma Hany Ibrahim to reach the main draw of the lucrative $100k tournament - offering equal prize money across the Men’s and Women’s draws - which will see live squash return to Egypt's iconic Great Pyramid of Giza for the first time in a decade. Grinham and Evans came through their encounters with relative ease but Wern and Moverley were forced to dig deep into their reserves to come through tough 5-game battles with Shahin and Ramadan - with Moverley in particular impressing as she rallied from two-games down to seal the win and set up a first round encounter with Nicol David in a match that will take place on the stunning all-glass court situated in the shadow of the Great Pyramid. In the Men's event Lobban upset the seedings to take out fancied Egyptian talent Mohamed Abouleghar and prevent a local clean sweep in qualification, with Omar Abdel Meguid, Karim Ali Fathi and Mohamed Reda all moving into the main draw. After the withdrawal of French top ten player Mathieu Castanet this morning due to a calf injury, Egypt's Zahed Mohamed will now also compete in the main draw as a lucky loser, and will face Spaniard Borja Golan. The Great Pyramid of Giza - one of the seven wonders of the world - will provide the backdrop to a five-day squash extravaganza this September that will see Egyptian World No.1s Mohamed ElShorbagy and Nour El Sherbini lead a star-studded field at the 2016 Al Ahram International - the iconic tournament which returns to the PSA World Tour calendar for the first time since 2006. Taking place in an open-air court in front of the Pyramids from September 19-23, the Al Ahram International will see players competing for a share of the $200k prize fund which will be split evenly across the Men's and Women's draws - the first time a major tournament in Egypt has offered parity in prize money. 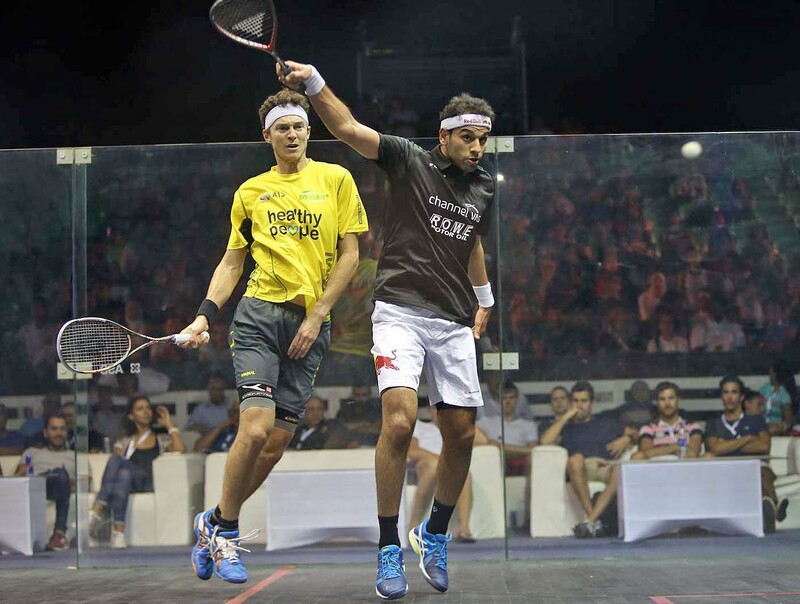 Having dominated the Men's Tour in 2015/16, claiming an unprecedented six of seven World Series titles, ElShorbagy will be firm favourite to claim the men's crown while fellow Alexandrian El Sherbini, the 20-year-old World Champion and British Open Champion, is odds-on to deliver double home success. 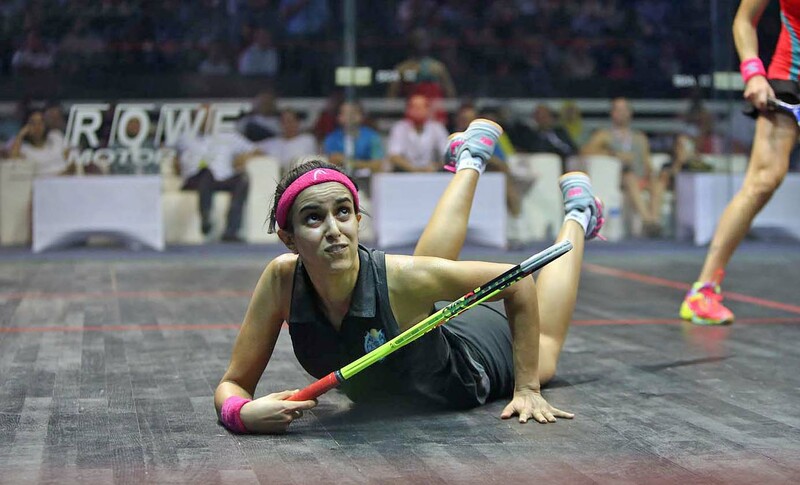 ElShorbagy's main rivals will come in the form of compatriots Omar Mosaad, the 2015 World Championship runner-up, three-time World Champion Ramy Ashour and French danger-man Mathieu Castagnet while El Sherbini will have to be at her best to hold off the challenge of Malaysian eight-time World Champion Nicol David and former World No.1 Raneem El Welily. 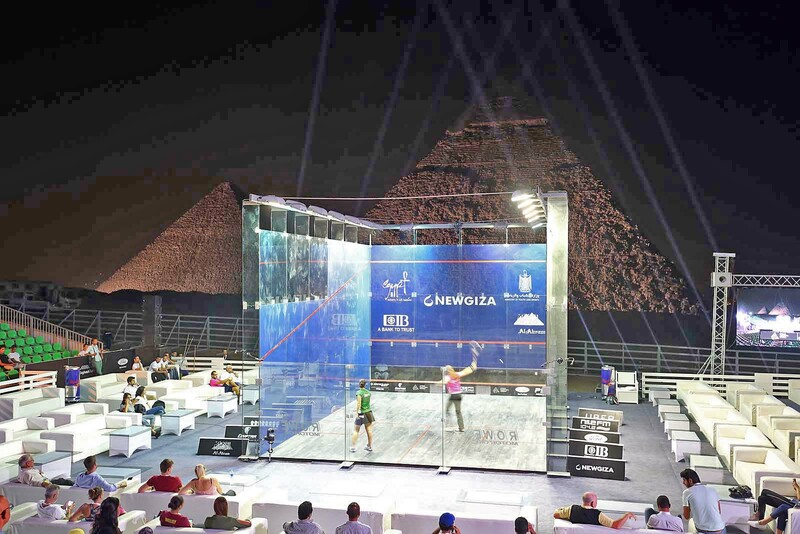 "This September's tournament in front of the Great Pyramid of Giza is certain to be one the most spectacular settings in world sport and we are excited to be working with all partners to help ensure the tournament is a success," said PSA CEO Alex Gough. "Squash has an unmatched ability to showcase the most stunning locations in the world and the strength and depth in the playing field will lead to a truly spectacular exhibition of world class sport for both spectators and television viewers." A total of 56 players from 13 nations will travel to Giza for the tournament, with qualification beginning on Saturday September 17 at Cairo's Le Lido City View Clubhouse. The Professional Squash Association (PSA) have today announced that the Great Pyramid of Giza – one of the Seven Wonders of the Ancient World – will once again provide the backdrop for a professional squash tournament when the 2016 Al Ahram International takes the sport back to its most iconic location ever for the first time in a decade. The breathtaking pyramids were the setting for the 2006 World Championship, providing imagery of one of the most iconic sporting locations ever, and after an agreement was reached between the PSA, Egyptian Squash Federation and promoter Amr Mansi [Managing Director of I Events], the sport's top stars will once again compete in front of the trio of structures this September, when the tournament gets underway on September 19-23. A 16-strong draw featuring both a Men's and Women's event will see the world's elite compete for a share of a $100,000 prize fund as part of what promises to be an electric 2016/17 PSA World Tour season. 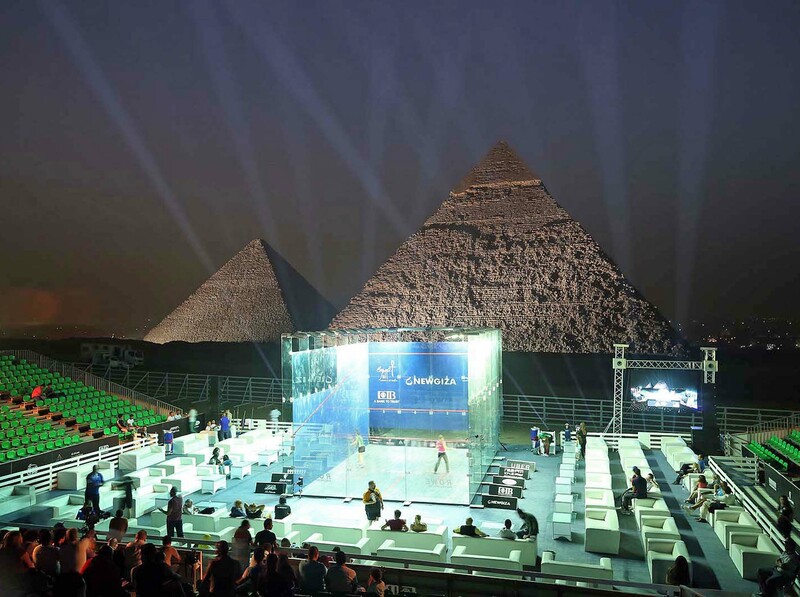 “We are delighted to have reached an agreement with the Egyptian Squash Federation and promoter Amr Mansi that will see squash return to one of the most spectacular settings in world sport in front of the the Great Pyramid of Giza later this year,” said PSA COO Lee Beachill. “The images captured during the 2006 World Championship, the last time the sport was played there, continue to set the standard for all other squash tournaments, and many other sports around the world, to aspire to and showed the world that squash has an unmatched ability to showcase the most stunning locations in the world. I Events managing director and tournament promoter Amr Mansi said: “Bringing squash back to the Great Pyramids of Giza has been an ambition for me over the past few years and the Al Ahram International Squash Open was the first inspiration to me to start this career of promoting squash events in Egypt . I would like to take this opportunity to thank the Egyptian Squash Federation and the PSA for working together to make the Al Ahram International Squash Open return once again. “The Al Ahram International tournaments of the 1990s and early 2000s inspired an entire generation of Egyptians to take up squash and, with the country currently dominating at the top of the world rankings, we believe that this year’s tournament could serve to inspire another generation of Egyptian superstars. Egyptian Squash Federation President Mr Assem Khalifa added: “We are glad to announce that we will once again be hosting one of the most distinguished squash events in the world here in Egypt.